David Lloyd Leisure has launched an advertising campaign that sees the brand splashed across central London taxis over the next 12 months. Europe’s premier health, sports and leisure group kick-started the campaign with TV investigative journalist and broadcaster Donal MacIntyre hailing one of the bespoke taxis to embark on a workout with difference! 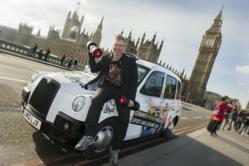 Donal, of BBC MacIntyre Undercover fame, hitched a ride to some of London’s most famous landmarks, including Buckingham Palace, the Houses of Parliament, Big Ben, the London Eye, Trafalgar Square and Tower Bridge, to launch a Facebook competition featuring the branded hackney carriages. David Lloyd Leisure is asking its 40,000-strong audience on Facebook to submit their own photos taken with its cabs. The most ‘liked’ entry posted will win a six-month individual membership prize, or alternatively a three-month couple or family package. He added: “I’ve been on some weird, wonderful and often dangerous assignments all over the world, using various modes of transport to get there, but I can honestly say that this is the first time I’ve hailed a taxi to play tennis by the London Eye or lifted weights next to Buckingham Palace. The taxi campaign, which aims to reach consumers across central London and drive footfall to the group’s clubs, has been put together in conjunction with advertising and marketing agency Law Creative. It features branded side panels on the outside of 10 cabs showcasing David Lloyd Leisure sport and leisure facilities and services, with further advertising on the tip seats and interior fittings. “Londoners are keen to get the most out of life and fitness is always somewhere near the top of the priority list, so capturing their attention has long been a focus for us,” said Suzanne Hall, David Lloyd Leisure’s acquisition marketing manager. “The quintessentially British black cab provides a stylish platform to promote the David Lloyd Leisure brand in a unique and dynamic way. Note to editors: For further information about this press release, contact the David Lloyd Leisure press office on 01707 289833/4 or email press(at)davidlloyd(dot)co(dot)uk. The David Lloyd Leisure Group operates 81 clubs in the UK and a further 10 clubs across Europe. It has over 440,000 members and employs 6,000 people. This includes an expert health and fitness team of over 1,800, while it contracts the services of more than 400 tennis professionals. Across all clubs, David Lloyd Leisure has over 150 swimming pools (of which half are indoor) and offers over 10,000 exercise classes per week. Every week 20,000 children learn to swim at David Lloyd Leisure and 14,000 learn to play tennis. Its racquets facilities are unparalleled with 700 tennis courts as well as 180 badminton courts and 140 squash courts. Additional facilities include health and beauty spas, club lounges with free internet access, crèches, nurseries and specialist sports shops.